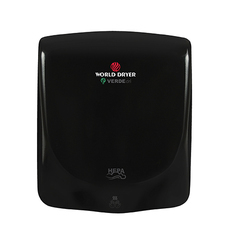 Hi-Speed Surface-Mounted ADA Compliant Hand Dryer VERDEdri� is a high speed, surface-mounted ADA compliant hand dryer featuring HEPA filtration system and antimicrobial technology. VERDEdri is extremely energy efficient utilizing only 950 watts of power. The adjustable two speed motor controls and global universal voltage features accommodate any commercial washroom environment.